Royal Mail has released details of the Prime Ministers stamps to be issued on 14 October 2014. Originally shown to the trade as a set of 8 x 1st class stamps (with Clement Attlee the only one not in colour) the set is now revealed as 4 x 1st and 4 x 97p, with the same portrait of Attlee now coloured. The 1st class stamps show Margaret Thatcher, Harold Wilson, Clement Attlee, and Winston Churchill. 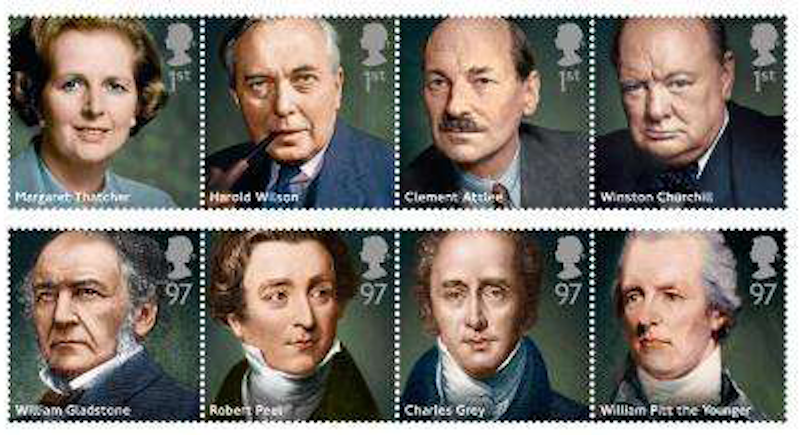 The 97p stamps show William Gladstone, Robert Peel, Charles Grey and William Pitt the Younger. The stamps will be printed in litho by International Security Printers, in two sheets of 24/48, ie 6 se-tenant strips of 4. Although the Churchill portrait by Yousuf Karsh is probably the best known it is also probably the most reproduced and it seems a pity that Royal Mail couldn't find a different portrait to the one that they (and Australia and New Zealand) used in 1965. More details and first day postmarks on our website. Royal Mail have told me that "We're not planning to do a(n operational slogan) postmark for our Prime Ministers stamps issue." I was expecting 10. Disraeli and Lloyd-George spring to mind. Lloyd George appeared on a stamp in the issue Great Britons in April 2013. You're quite right about Lloyd-George; I checked my Concise 2013 but there was no mention of him as the listing ended at March, hence the error. He appeared on a set of booklets during 1994 along with Asquith, Churchill and Attlee. What about Walpole the 1st PM ? Well he is in the Hanover mini sheet of Sept 2011. Poor old Disraeli, he was such a character and most people will probably have heard of him, even if they have no interest in politics. He was in Parliament for decades. Also an author. Disraeli featured on the 31p Victorian Britain stamp in 1987. Thanks Robert that's brilliant. There couldn't be a Gladstone stamp without a Disraeli, Victoria wouldn't be at all pleased. She complained that Gladstone spoke to her as though he was addressing a public meeting. Disraeli made her Empress of India. Yes, I wonder why they repeated him ? Churchill has to be there again as the great war time leader. As far as repetitions are concerned what about the actress Vivien Leigh ? British Films 1985, Centenary of the Cinema 1996, Great Britons 2013, Front page of the British Philatelic Bulletin April 2011, and the same image in the left margin of the Royal Shakespeare Company mini sheet of April 2011. M, I share your concerns, most stamps should be 1st and 2nd class. Perhaps Tallents House feel they need to bear in mind their overseas customers and this may be for the good of GB philately in general. I seem to recall that during the 1980's we were told that each set would comprise of no more than four stamps unless there were exceptional circumstances. Not really a fan of these stamps, some of them have been done before, a few repetitions in this set from previous years. I hate to think of how some people are going to react when they see Maggie Thatcher on a 1st class stamp, I don't think many people would want to lick the back of the stamp ha ha.. Still awaiting the list for 2015 stamps usually they are released by now from RM, at least what they are going to released in the first 6 months of the new year. The stamp programme is never announced until Stampex, ie around 20 September each year. And as you say, the first 6 months of 20i5 we will have in detail, the remainder of the year only in outline. And even then, under new arrangements, we will not be able to tell you until Royal Mail say so.